Here’s what you need to know about printing year end church giving statements or church contribution letters for your church members. You can refer to the official IRS publication here for the specific details. Why do we need to print church giving statements? People who contribute to your church will want to deduct those contributions when they file their tax return in April. To do so, they will need to provide proof of those donations to the IRS. That proof is usually a “contribution statement” or “giving statement” that reports the total tax-deductible contributions for each person or family. Technically, you really only need to provide statements for people who contributed $250 or more for the year. Proof of contribution isn’t required for totals below that amount. It’s not just regular members who should receive statements, but even visitors who give over $250 should get them too. Who gets the giving statements? Giving statements should be delivered to donors, not to the IRS. Typically, giving statements should be sent out by January 31 so the donors can provide the information to their tax preparers. What needs to be included on the statements? It’s a good idea to also include your Tax ID number, but it’s not required. 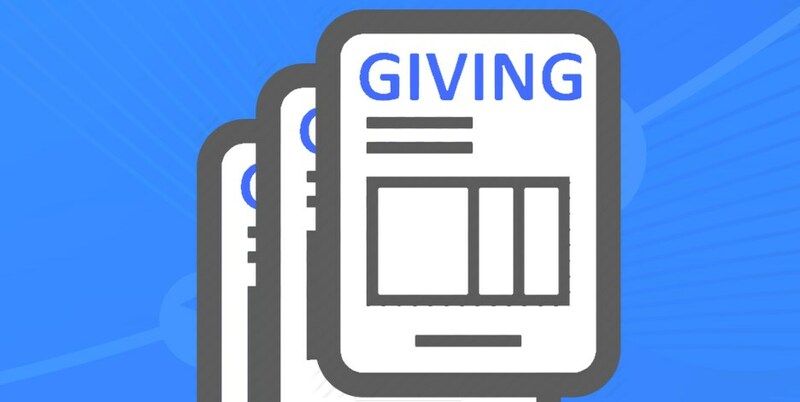 Even though only a total is required, many churches like to include line items of each donation so the donor can verify against their own records and ensure everything is correct. To see an example of a contribution statement, see the video below. 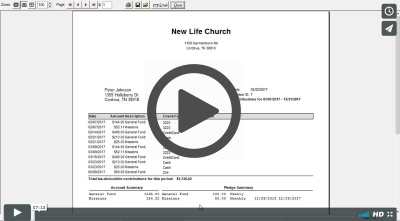 For a smaller church, it may possible to simply create a Word or Excel document with one page per person, where you record the contributions throughout the year, then you simply print the document a the end of the year. Most churches will need better tracking and reporting, so they can see at any moment how much income is received towards different funds such as Tithes, Missions, etc… Churches may even record pledges for members, and will want to see amounts pledged vs given.